Happy national chocolate caramel day! 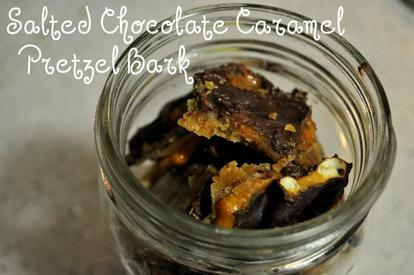 Celebrate with this delicious Salted Chocolate Caramel Pretzel Bark!! 1. Wrap a baking sheet with tin foil. (You may be inclined to use parchment paper, but the caramel is uber annoying to pull off the parchment, so tin foil is highly recommended) Preheat the oven to 400 degrees. 3. Once the butter is melted, add the sugar and stir to incorporate. Allow the sugar and butter to softly simmer and bubble, but don’t let it boil, so adjust the heat accordingly. Stir occasionally. The browning process should take about three minutes from when it starts to bubble. 4. Once the sugar and butter have caramelized, pour the mixture evenly over the pretzels on the baking sheet. Strafing it back and forth down the length of the sheet works well. The caramel hardens pretty quickly so it’s important to pour it as evenly as possible from the start. If you end up with any clumps, just use a spatula to spread the caramel as best you can. But clumps are not the end of the world! “‘Rustic’ is culinary school speak for messy.” I’m totally ok with that. Bake the pretzel-caramel mixture in the oven for 5-7 minutes. 5. In the meantime, set up a double boiler. Fill a saucepan about a quarter ways full with water. Place the pot over a medium flame. Take a large, heatproof bowl and set it on top of the saucepan. Be sure that the water in the pot will not touch the bottom of the dish, otherwise your chocolate will burn! Pour the chocolate chips into the bowl and stir constantly until they’re completely melted. 6. By this time the pretzel-caramel mixture should be done and out of the oven. Pour the chocolate over the pretzel-caramel mixture evenly, again careful to strafe chocolate back and forth down the length of the sheet. 7. Spread any remaining thick spots of chocolate with a spatula. Sprinkle sea salt evenly over the bark. Place it in the fridge to cool and harden for about an hour. 8. Once it’s done, the tin foil should pull off easily and you can break the sheet into smaller, bark-like pieces.